Clefairy in game: 847 Who? Important notice! Pokemon Clefairy is a fictional character of humans. Clefairy (Japanese: ピッピ Pippi) is a Fairy-type Pokémon introduced in Generation I. Prior to Generation VI, it was a Normal-type Pokémon. It evolves from Cleffa when leveled up with high friendship and evolves into Clefable when exposed to a Moon Stone. 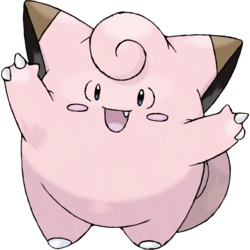 Clefairy is a bipedal, pink Pokémon with a chubby, vaguely star-shaped body. A small, pointed tooth protrudes from the upper left corner of its mouth. It has wrinkles beside its black, oval eyes, dark pink, oval markings on its cheeks, two small wings, and large, pointed ears with brown tips. A tuft of fur curls over its forehead, much like its large, upward-curling tail. Each stocky arm has two small claws and a thumb on each hand, and each of its feet has a single toenail. Clefairy is very shy and rarely shows itself to humans. On the rare occasions it does come down from its mountain home, it can be seen dancing under the light of the full moon. Once the sun starts to rise, it returns home where it sleeps nestled with other Clefairy. Though incapable of flight, Clefairy's wings can store moonlight and allow it to float. 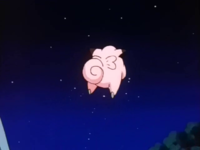 The anime has shown that Clefairy is actually an extraterrestrial Pokémon. Clefairy's debut appearance was in Clefairy and the Moon Stone. A group of Clefairy were stealing things in Viridian City to repair their spaceship during Clefairy Tales. Jigglypuff beat up the Clefairy leader for stealing its microphone/pen. These Clefairy made another appearance in Wish Upon a Star Shape. In A Goldenrod Opportunity, a Clefairy was used by Whitney to send Team Rocket flying and in the Gym Battle against Ash. The Fairy Pokémon was defeated by his Cyndaquil. Several Clefairy also appeared in A Real Cleffa-Hanger, when Ash and his friends visited Mt. Moon again. 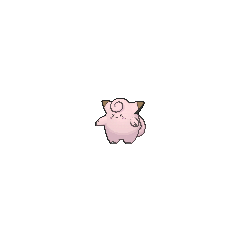 Multiple Clefairy also appeared in The Power of One. 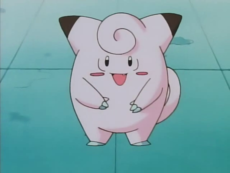 A Clefairy appeared in Team Rocket's fantasy in Imitation Confrontation. A Clefairy appeared in Lights, Camerupt, Action! under the ownership of Red in a film that Ash and Gary were watching when they were younger. A Clefairy appeared as a plush toy in A Jolting Switcheroo!. EP006 Clefairy Ash's Pokédex Clefairy. This impish Pokémon is friendly and peaceful. It is believed to live inside Mt. Moon, although very few have ever been seen by humans. There are two chapters in the The Electric Tale of Pikachu manga which focus on Clefairy. In the third chapter of the manga, Clefairy Tale, Ash discovers a colony of Clefairy with Bill and Professor Oak. The three humans assist with and witness an evolution ceremony. This chapter appears to be loosely based on the anime episode Clefairy and the Moon Stone. The second chapter to feature Clefairy is Clefairy in Space, the tenth chapter of the manga. In this chapter, a herd of wild Clefairy are causing trouble in Apple City, where rumors are circulating that Clefairy come from outer space. This chapter was based on the anime episode Clefairy Tales. 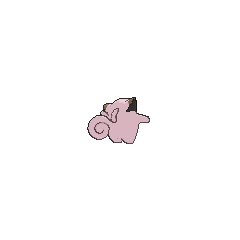 In this chapter, it is learned that Clefairy have a secretion from the back of their throat that can harden into a crystal-like form. 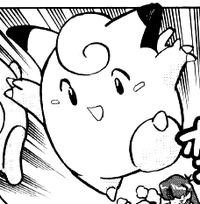 One of Hazel's main traveling companions in the Magical Pokémon Journey manga is a timid, shy Clefairy. Clefairy tends to be very cowardly, but when he actually does battle, he can use his powerful Metronome attack. Clefairy also returns as a main character in Pokémon Chamo-Chamo ☆ Pretty ♪. Green had a Clefairy named Clefy which first appeared in A Little Kadabra'll Do It that later evolved into Clefable in The Winged Legends when Red used his Moon Stone on him. Although he was used only once for distraction against Sabrina prior to evolving, his increased power allowed him to stall Thu-Fi-Zer for a short period of time with his Metronome. Daisy Oak also has a Clefairy used in Contests when she was younger, which first appeared in It All Ends Now III. Rad Rickshaw owns two Clefairy nicknamed Cliff and Cliffette as seen in Cautious Clefairy. Clefairy is one of the main characters in the Pokémon Pocket Monsters manga and is Red's starter Pokémon. Clefairy is often very rude and stupid, gaining him the nickname "Blockhead Clefairy". He is the source of much slapstick humor in the manga. Blaine has multiple Clefairy which were used as a punishment when Red's Clefairy got the final question to the quiz wrong of the Pokémon Quiz Battle. Red of Pokémon Ruby-Sapphire also owns a Clefairy. When released from a Poké Ball, Clefairy will use Metronome to copy another Pokémon's move randomly. 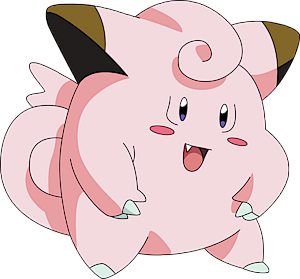 Clefairy also uses Metronome but uses its own series of attacks such as Blizzard, Explosion, or Fire Spin. All will hurt any opponents close to Clefairy. Clefairy are very cute Pokémon, which makes them popular pets. However, as they're only found in a few areas, it takes a lot of work to find one. Strangely enough, legend has it that Clefairy are more active during the full moon. These Pokémon are known to use Metronome, a move that unleashes a randomly selected technique. Pokémon Stadium: Clefairy stars in the mini-game "Clefairy Says." Players are given a pattern of arrows to repeat back. Each time the player messes up, they will receive a strike. After five strikes, the player is out. The last Clefairy standing wins. D/P/Pt: In Veilstone City's Slot Machines, the bonus rounds function with a Clefairy which points to which reel to stop first. Its magical and cute appeal has many admirers. It is rare and found only in certain areas. Adored for their cute looks and playfulness. They are thought to be rare, as they do not appear often. Because of its adorable nature, it is in high demand as a pet. However, it is rare and found only in limited areas. Its adorable behavior and cry make it highly popular. However, this cute Pokémon is rarely found. Though rarely seen, it becomes easier to spot, for some reason, on the night of a full moon. On every night of a full moon, groups of this Pokémon come out to play. When dawn arrives, the tired Clefairy return to their quiet mountain retreats and go to sleep nestled up against each other. On every night of a full moon, they come out to play. When dawn arrives, the tired Clefairy go to sleep nestled up against each other in deep and quiet mountains. Its adorable appearance makes it popular as a pet. However, it is rare and difficult to find. With its magical and cute appeal, it has many admirers. It is rare and found only in certain areas. It flies using the wings on its back to collect moonlight. This Pokémon is difficult to find. On nights with a full moon, Clefairy gather from all over and dance. Bathing in moonlight makes them float. Its adorable behavior and appearance make it popular with men and women, young and old. Its numbers are few, however. On nights with a full moon, they gather together and dance. The surrounding area is enveloped in an abnormal magnetic field. Moves marked with a superscript game abbreviation can only be bred onto Clefairy in that game. 51%-100% HP Clefairy feels a little shy, but Clefairy will fight! Level up Clefairy's level went up! Joy! The more Clefairy in the puzzle area, the more damage. 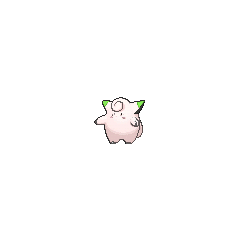 For other sprites and images, please see Clefairy images on the Bulbagarden Archives. The prototype name for Clefairy was Aria. Clefairy and its evolution share their category with Snubbull and Granbull. They are all known as the Fairy Pokémon. 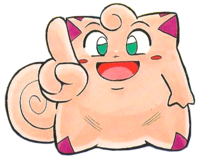 Clefairy was originally going to be the official mascot of Pokémon, but Pikachu was used instead due to the popularity of the anime and Pikachu's familiarity with fans. 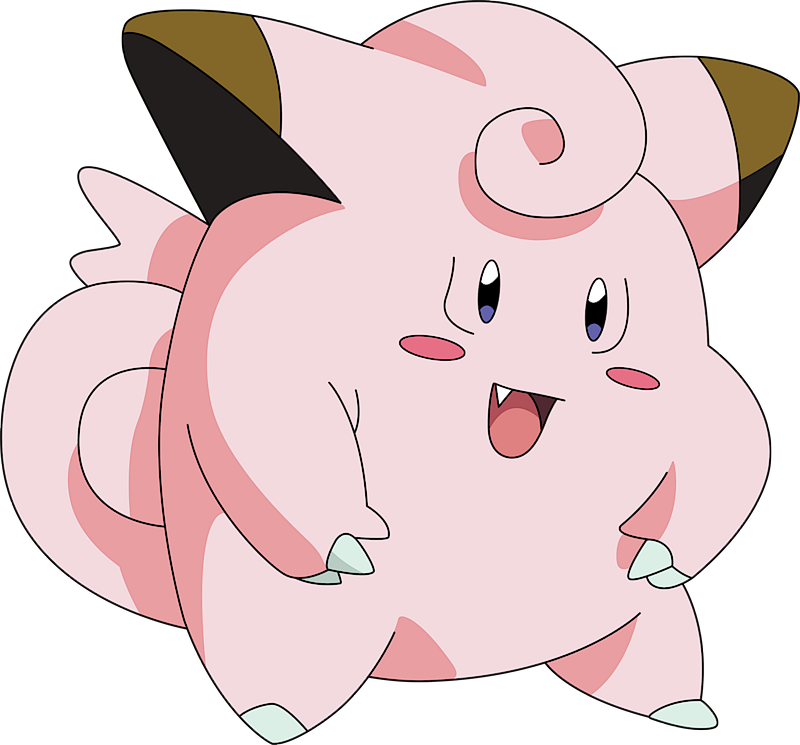 In the original pilot episode of the anime, Clefairy was intended to be Ash's starting Pokémon. Due to a last minute change, the role went to Pikachu. This would have made the anime closer to the Pokémon Pocket Monsters manga, which would later be referenced in Lights, Camerupt, Action!, where its main character, Red, along with his Clefairy starred in a film that Ash and Gary were watching when they were younger. The Poké Doll is an item based on Clefairy. Clefairy is the first Fairy-type Pokémon in National Pokédex order. It seems to be based on a fairy, being a magical, somewhat humanoid, winged creature, lending credit to its name. 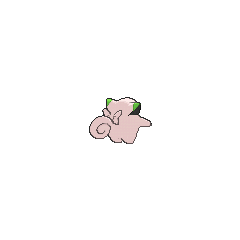 Clefairy is a combination of clef (French for [musical] key) and fairy. Pippi may be a shortening and repetition of pixie. Jump up↑ Pikachu's Global Adventure: the Rise and Fall of Pokémon. By Joseph Jay Tobin. Page 63. Jump up↑ Lucard, Alex. "Beckett's Ultimate Guide to Pikachu!" Beckett Pokémon Unofficial Collector July-Aug. 2010: 17.